Practices (6): 6-7pm, Thursdays, May 22/29 & June 5/12/19/26. Racing: Tuesday July 1, 2014 on Toronto's Centre Island. 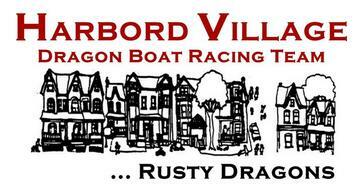 This is the second year for this team centered on the Harbord Village community which has been Rusty Dragon's founder Tim MacFarlane's home for over 30 years. While recruiting will focus on registering paddlers who live or work in the area, is not restricted in who can join the team. NO experience is required in any way. 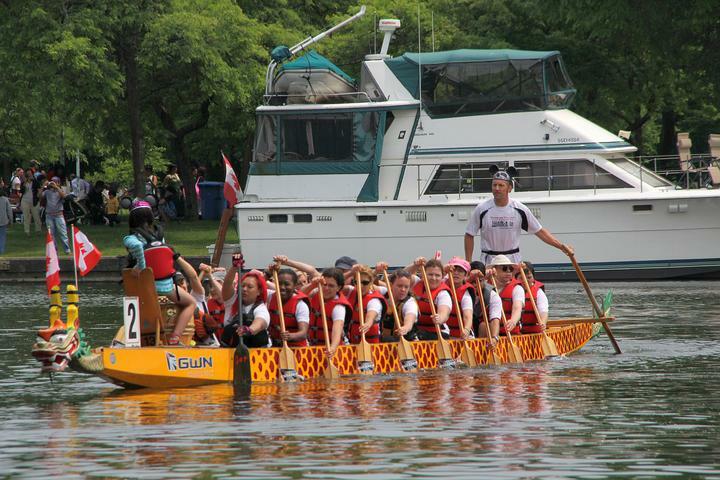 The coach will take you from never having sat in a dragon boat to racing on Canada Day at this special event. The objective is for this to be a fun experience for everyone (men or women of ANY age, and young adults aged 14 and up). 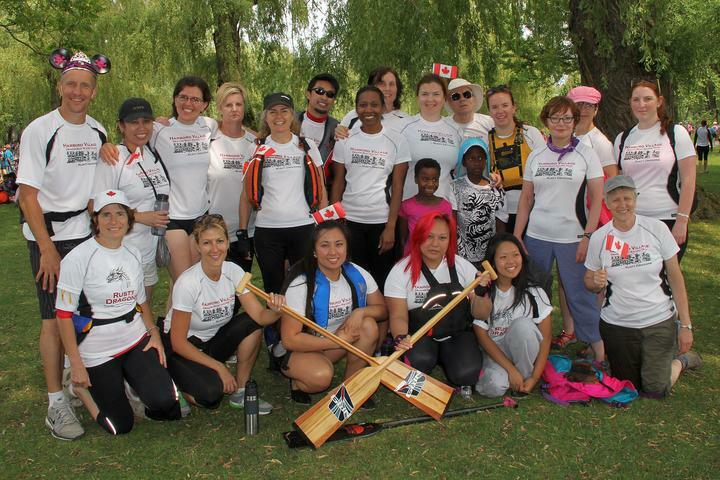 This team will race at the 130th DDRA Canada Day Regatta at Toronto's Centre Island on July 1st (YES, 130th annual - it started in 1884 for canoe/kayak and rowing teams, and dragon boats were added in 2003). The non-profit registration fee is $73 per person, which includes all practices and race day as well as use of life jackets and paddles. It also includes a $5 donation in support of the Kensington Gardens Hospice. l Dates: Thursdays, May 22 / 29* and June 5 / 12* / 19 / 26* (6-7pm, except * entries 7-8pm). l Date: Tuesday July 1st (Canada Day). The day starts at about 8:00am and ends about 4:00pm. Note that $5 from this fee is a charity donation towards Kensington Gardens Hospice. 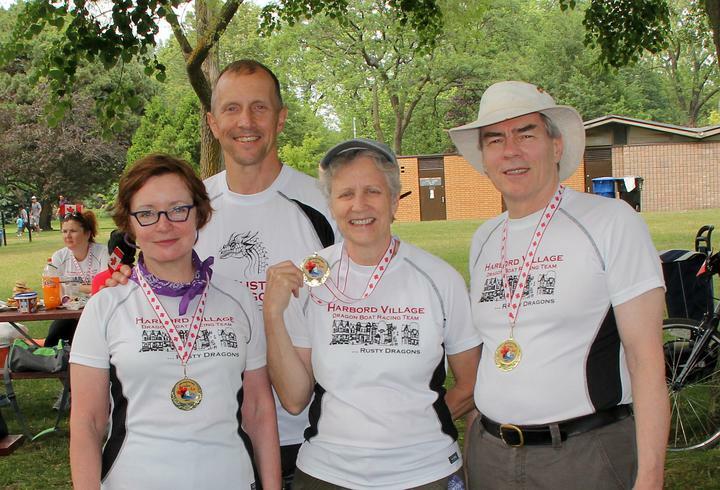 Latest News (June 20): We have just a few practices left, and can accept a few more paddlers on the team at the pro-rated registration fee of $55. Registration is open to anyone, with no experience required. You do not have to be a resident of the Harbord area. The HVRA now has a dedicated web page for our team, and team member Leslie Thompson wrote a great article there about the team. Click HERE or the HVRA logo top right of this page to see the article. 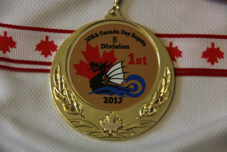 Last year in review: In 2013 we raced at our first ever regatta and we paddled in sync and with power and speed to win "B" Division and earn gold medals. We were proud to wear our new Harbord Village jerseys! Thank you to team captains Dinny Biggs and Christian Mueller for helping manage the team from start to finish. ​Photo above: A great picture of the Harbord Village team coming into the docks immediately after one of their their 500m races at Centre Island. All in SYNC and SMILING! That's what it's all about!! Coach Tim and daughter Sarah on drum with our Mickey and Minnie Mouse ears on. Click on the Harbord Village Resident's Association logo above to go to their web page dedicated to our team!